When I put Picture Polish Paris on my nails a few weeks ago it was very hard to resist grabbing my stamping plates and stamping the Eiffel Tower and various other french stamping designs. But I managed to step away from the obvious design and go with something pretty crazy. I'm going to call this a scaled leopard print design, scaled because it goes from big to small just like a scale. My thumb has super huge leopard print dots and they graduate down to tiny ones on my pinky. 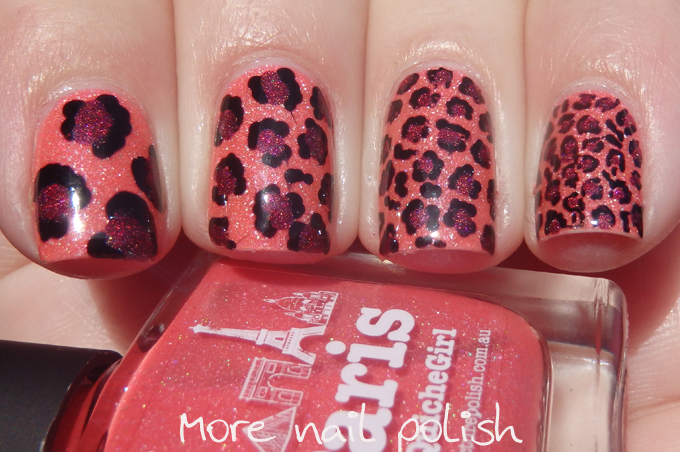 The base was Picture Polish Paris, and the leopard print dots use Picture Polish Moscow. 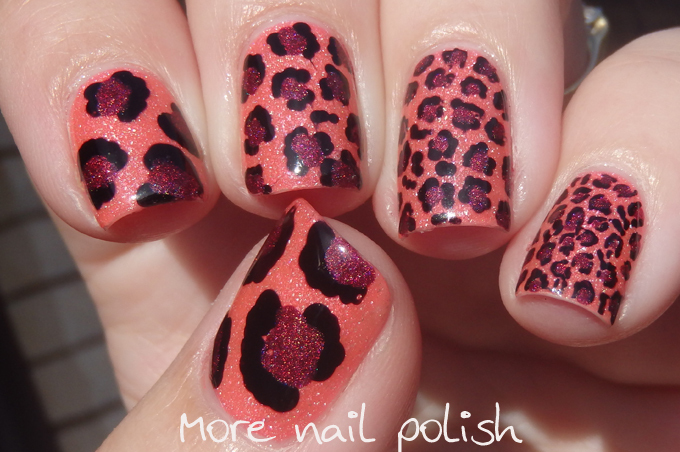 Which is your favourite sized leopard print? While we're here, lets take a look at Paris on it's own. Paris was created by French blogger Quiche Girl. I'm always so impressed when I see bloggers posting bilingually - but it also makes me feel dumb for only being able to speak one language. 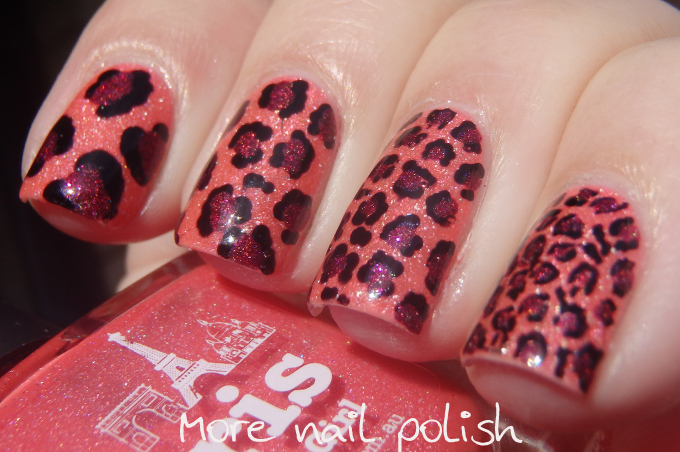 Paris is a lighter toned coral pink with the Picture Polish signature scattered holo. This one can look quite different if photographed indoors (or in a light box) compared to in the sun. My photos are in the sun and you see more of the coral tones, whereas the Picture Polish stock photos by Lacquertude look much pinker. Formula is good and the polish is opaque at two coats. This is two coats with Seche Vite top coat. Great colour combination! 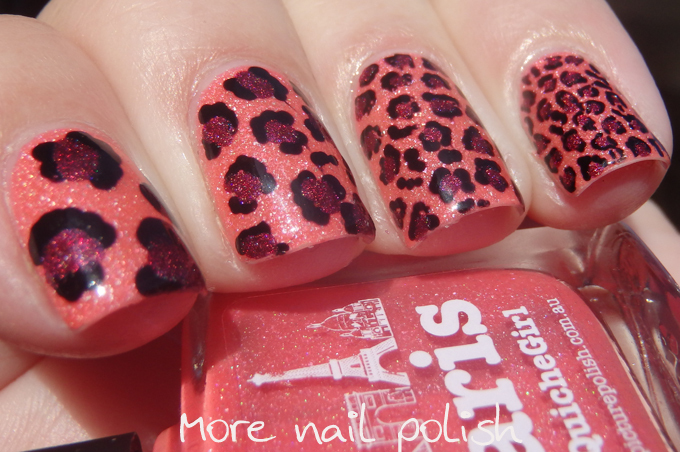 I like the leopard print a lot, I never knew it could look so great on a bigger scale. Don't feel stupid for knowing just one language, you can always learn a new one! I guess that for most people (for me at least) the only reason that they know multiple languages is because of the education system in their countries.